2. Finding newer construction which would help keep the repair costs down and CAP rate up was very difficult outside of Downtown San Jose. 3. 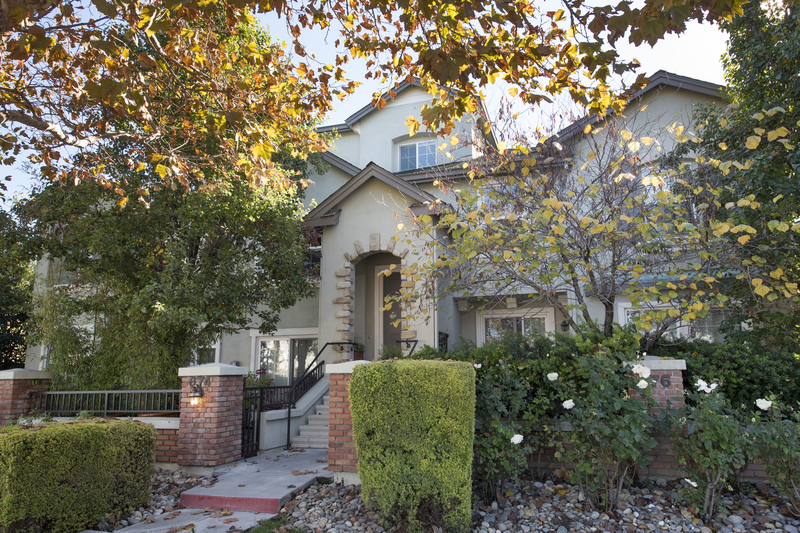 While inventory was low in places close to the employment centers in Santa Clara/San Mateo counties there were 90 condos on the market in downtown San Jose. 4. Major tech companies were looking at buying up some large industrial parcels close to downtown San Jose and in fact Samsung and Apple had already started the process. 5. Young tech workers were choosing to live in down town San Jose and filling up places like San Pedro Square on week end nights and using public transportation to get to Mountain View, Palo Alto, etc. 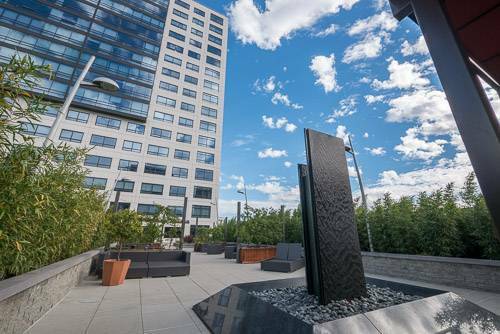 It was was for me to see that investing in downtown San Jose condos was going to pay off big time, both from a cash flow and investment perspective. So, my Silicon Valley investor bought FOUR downtown condos, 2 at the Brickyard for $265,000 and 2 at Axis San Jose for $465,000 in Dec, 2014. For the past 3 years she has gotten her 4% return on investment after expenses with good appreciation, until last summer when appreciation went through the roof. One bedroom Brickyard condos are selling in the high 400,00's and studios at the Axis are selling in high 500,000's. On June 6, 2017 Google announced they were expanding into Downtown San Jose and since then every metric of real estate appreciation has shown phenomenal growth. Average sales price of Downtown San Jose Condos increased for $650,000 in June of 2017 to $775,000 in Dec 2017. 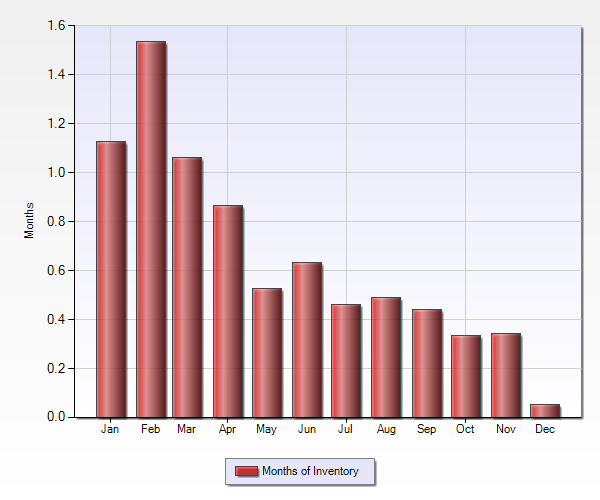 The months of inventory in downtown San Jose condos (amount of time it would take to sell off all of the current inventory at current pace of sales dropped from .62 months in June to .025 months in Dec of 2017. Sales to list price ratio of downtown San Jose condos went from 103% over list in June to 111% over list in Dec. of 2017. These numbers are made even more remarkable by the fact that historically most Silicon Valley appreciation occurs in the first 6 months of the year, not the second 6 months. And so you can see that the Google bump is making buying a condo in Downtown San Jose very difficult, and much more expensive. It may be time for a San Jose real estate investor to think about looking further south to find the next area of such wild appreciation while getting the best CAP rate possible right now. If you have any questions about buying a San Jose or Silicon Valley rental property please feel free to contact me. The rains are starting again. Yay!!! This is great news for California. 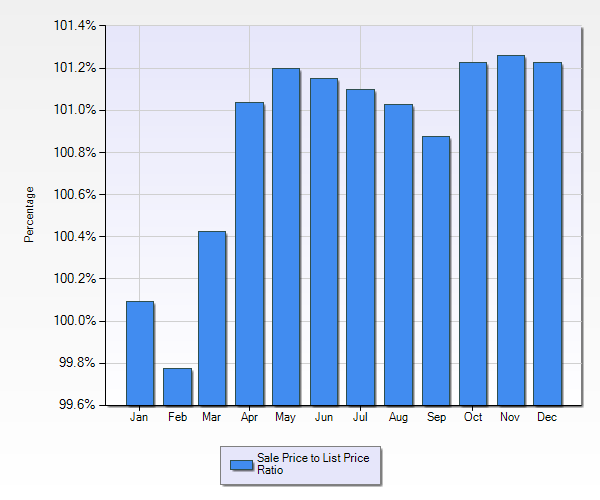 It is not always great news for Santa Cruz home sellers. Many Silicon Valley rental property investors go to Santa Cruz when the sun is shining and the temps are in the 70's, see what a great place it is, discover how high the rents are and how relatively affordable the Santa Cruz housing prices are, and decide to buy a Santa Cruz rental property in the summer, along with the everyone else. As you can see from the chart above there was significantly less competition for Santa Cruz homes last winter in the heavy rains than after the rains stopped. 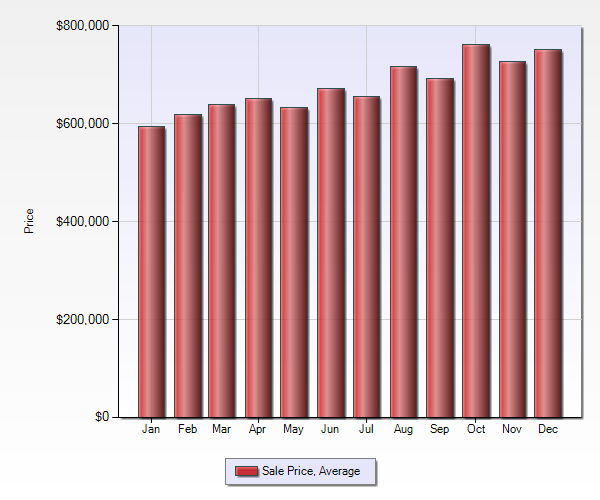 The chart shows sales to list price ratios by month. In general, the more buyers there are the higher the price will be and the higher over list price a Santa Cruz home buyer will need to offer. 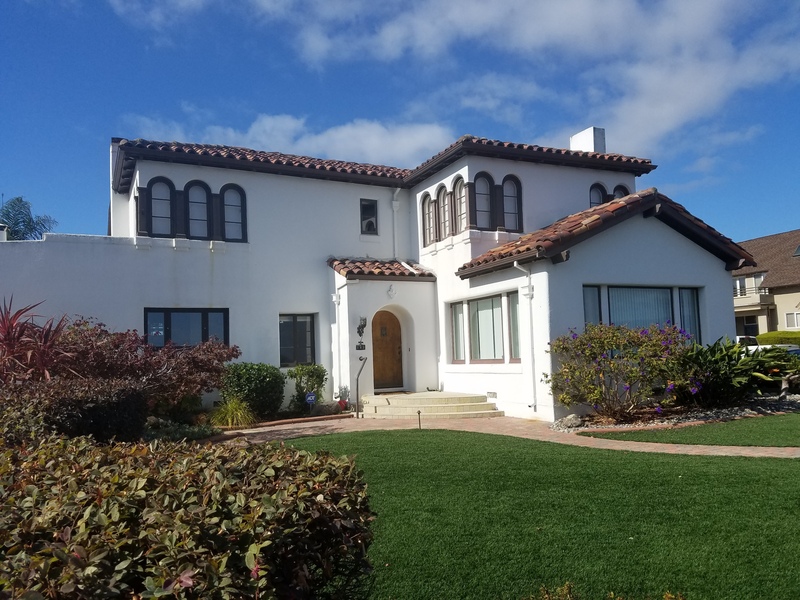 So if you are a Silicon Valley property investor thinking of buying a Santa Cruz rental property, get out your umbrella, put on your boots, and drive over 17 looking for a Santa Cruz rental property to buy. Many young, well paid Professionals and Tech workers come to the Silicon Valley for good jobs, its wonderful weather, and incredible cultural and family friendly amenities. But they get here and find that the cost of Silicon Valley housing is prohibitive, or impossible to buy buy to the competition in their price range. Another issue that comes up all the time is that a young buyer can afford to buy a home, but does not want to live where or in what he or she can afford in the Silicon Valley. Added to this is the new tax bill which severely limits the amount of mortgage interest which is deductible and the substantial decrease in property tax and state income tax detectability. These changes make housing even less affordable for the average Silicon Valley resident. When faced with this dilemma many are choosing to rent in the Silicon Valley instead of purchasing a home in the Silicon Valley. I know there is a better way, because I have done it myself. Buy a rental property and rent your primary residence in the town where you want to live. When renting in the Silicon Valley you can almost always pay less than you would have to to purchase the same home on a monthly basis. You can probably live in a nicer place than you could afford to buy. However, over time prices go up, so the amount you have for a down payment should be put into Silicon Valley real estate so that you can keep up with housing appreciation and grow your wealth. In the last 5 years average sales price in Santa Clara County has risen from $800,000 to $1,600,000 for single family homes. 1. If you buy wisely your equity will grow. You should hire an experienced Silicon Valley investment property Realtor to help you pick what makes the most sense. 2. Speak to your accountant but things which are not a tax deduction for a Silicon Valley primary residence, or are severely limited, such as HOA dues, all interest on mortgages, not just up to $750,000, all property taxes, not just the 10K combined state and local taxes, and depreciation. This makes owning rental property very attractive to Silicon Valley investors. 3. The renter will pay your expenses and pay off your mortgage while you get to live closer to work, in a neighborhood with great schools and amenities, in a house that you like. 4. If you buy your rental properties with cash you can use the rent money to pay for your Silicon Valley Rental while reaping the benefits of your rental property. My rental properties are in Santa Cruz and I encourage my Silicon Valley investor clients to buy there. First I want to make it clear that I am not an accountant and I do not play one on TV. Anything I say should be verified with you tax and financial planners. That being said, after the passage of the latest tax bill, owning Silicon Valley rental property has become an even better investment for Silicon Valley real estate investors. 1. The tax bill restricts property tax deductions to a combination of 10K for both primary and second home property tax and state tax. For many Silicon Valley Real Estate investors this 10K limit is taken up completely just by state income tax. 2. This 10K limit does not apply to Silicon Valley rental properties owned by Silicon Valley Real Estate investors. Property tax is an expense that is subtracted from rental income before you owe any tax. 3. The tax bill restricts interest deductions on new mortgages, those initiated after Dec 15th, 2017, or before Dec 15th 2017 but not closed before April of 2018 to $750,000. 4. This restriction does not apply to Silicon Valley rental properties. If you are buying a Silicon Valley rental property over a million dollars, which many of them are, and want to get a loan, the interest on that mortgage is still considered an expense, no matter what the amount. The interest payment is subtracted from the rental income and excluded from Federal taxes. So, maybe it is time to think about investing in a Silicon Valley rental property as part of your financial plan. The trick is to find a Silicon Valley rental property that makes sense as far as your cash flow needs go. That is a discussion we can have on another day. 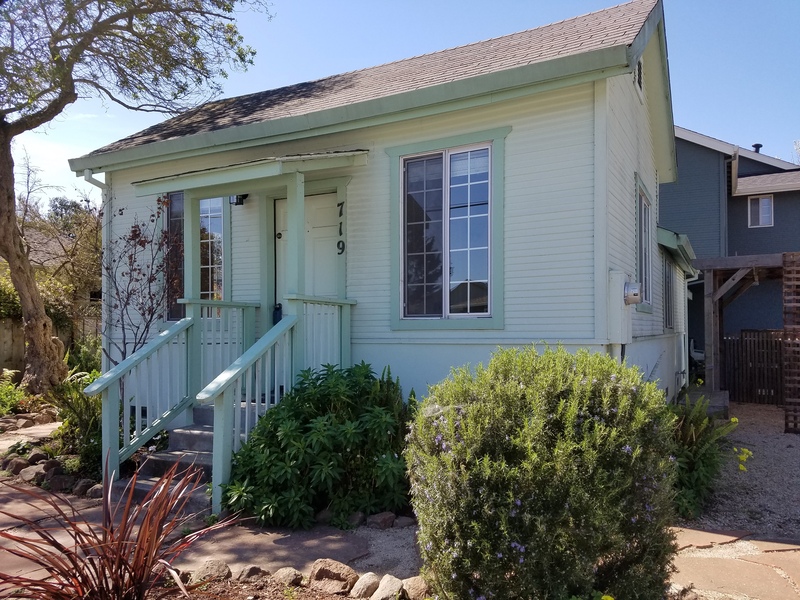 If you are one of smart Silicon Valley investors who is buying a rental property in Santa Cruz you may be buying one that has tenants in place. If that is the case it is very possible that the currrent tenants are not paying Santa Cruz market rental rates. 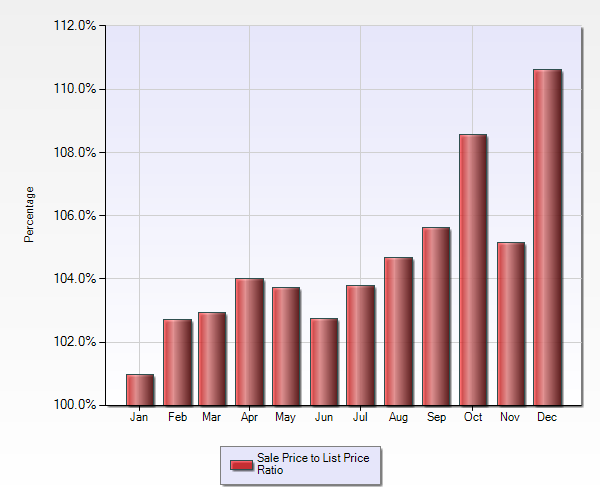 Current Santa Cruz rental market rates are at a very high level. It is common to get at least $1200 a bedroom and not unheard of to get $1600 a bedroom. So what is the best thing to do if you are a Silicon Valley inverstor and have Santa Cruz tenants paying $1000 a bedroom, or less? In my opinion, as a long term Silicon Valley/Santa Cruz real estate agent and Santa Cruz rental property investor myself it is sometimes better to keep the tenants in place with gradual rent increases than to give them a huge rental increase and risk having them move out. The reason for this opinion is based on numbers, not just my hesitancy to put a good Santa Cruz tenant out onto the street. When a Santa Cruz tenant moves out, especially if they have been there for 3 years or longer you will have to at a minimum paint and replace carpet. You may have to replace window coverings. You will have at best 2 weeks, and possibly a month of vacancy. So let's take a scenario of a 2 bedroom rental property renting for $2000 a month that you think you can get $2800 a month for with Santa Cruz market rents. So the first year you lose $900 if you did not raise the Santa Cruz rent at all. If the Santa Cruz tenant leaves after 1 year and no repairs are needed you can propably look at a 2 week vacancy. So you only lose $1900. You are in the hole. If the tenant stays the second year you will make an additional $9600 in rent so total gain is $8600 over 2 years and $18,200 over 3 years. If you raise the Santa Cruz rent $100 a month every year for 3 years and you do not have to paint, carpet, or replace old appliance over 3 years you make an additional $7200 over 3 years plus the $10,500 you did not spend so $17,700 over 3 years. So, if this is a long term Santa Cruz tenant you are only $500 ahead in 3 years by removing the original tenant and replacing them at market rate. In my opinion it is probably not worth it. What if you are only $300 a month under Santa Cruz market rate? then it is really not worth it. Santa Cruz, know for the beach, the boardwalk, Pacific Ave, hippies, and organic food, along with University of California Santa Cruz is also probably the best place for investors looking for rental properties right now. Here are some reasons why. No rent control but there is a one year moratorium on Santa Cruz short term rental permits so Air B&B investments not the way to go now. 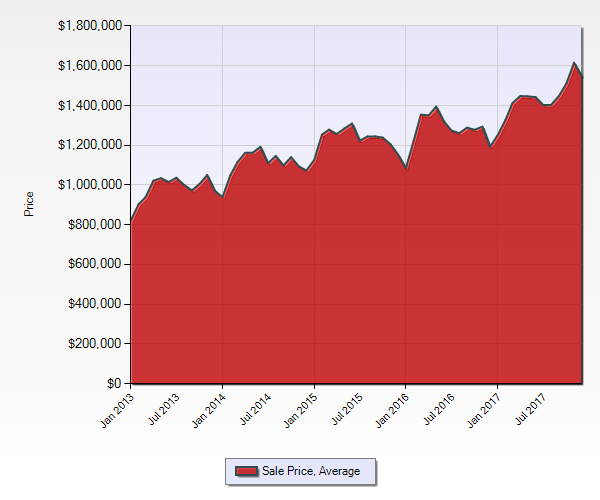 There are still Santa Cruz home sales contingent on the sale of another property, making 1031 exchanges much easier. Accepted offers almost always have contingnecies so you have time to figure out if the property makes sense for your portfolio. Would you rather visit your rental property in Santa Cruz or Milpitas? I would pick Santa Cruz any day. UCSC only guarentees housing for students for 2 years. They have over 18,000 students. The housing shortage is so acute that students are living 3 to a room or in their cars, not because they don't have the money for housing, but because there is such a shortage. Smart Silicon Vally investors should look at Santa Cruz as a place where your money goes further and the cash flow is so much better. I have put my money where my mouth is and own 3 Santa Cruz rental properties myself. I encourage you to contact me if you have any questions about how and why to buy a rental property in Santa Cruz. Many of my Silicon Valley Investors are finding that the price it costs to purchase an investment rental property in someplace like Palo Alto, Mountain View, or even downtown San Jose has gone up much faster that the rental market value has. It is not unusal to see CAP rates of 1 or 2 % which is the return on your investment after expenses are paid, but before any costs for a mortgage. So if your mortgage is 4.25% for an investment rental property and you only make 2% after expenses and before a mortgage you will lose 2.25% in cash flow over the year. What that means is that on a million dollar property with a $700,000 loan you will have a negative cash flow of about $17,500 every year. When the market appreciates you make up for the loss in appreciation, but when the market goes down, you lose the negative cash flow as well as the decreased value in the property. In order to keep your cash flow, at least neutral, you need to have a CAP rate closer to your mortgage, which you can do by becoming a Santa Cruz rental property owner. If a Santa Cruz rental property owner buys a million dollar property at a 4% CAP rate and a loan of $700,000 at 4.5% the difference between profit and loan payments will only be about $3500. These numbers are not exact as loan rates change daily and amoratization schedules are different, but the bottom line is the lower the CAP rate the worse the cash flow. Due to the prices in Santa Cruz being so much lower than the prices in the Silicon Valley and the rents being fairly equivalent, the cash flow and CAP rate are just better for Santa Cruz rental property owners. UC Santa Cruz posts average rental rates every year. These figures include both unfurnished and furnished rentals. They can include the cost of utilities, Wi-Fi, private baths, allowing two or three people per room, special locations (e.g. oceanfront), housecleaner, and/or gardener. The locations vary from the San Lorenzo Valley to Aptos with the majority being in Santa Cruz. We cannot confirm these listings were rented at these prices. Students will pay $500-$850 to share a room. Some rooms have 2 and some 3 students. This puts upward pressure on all the rentals in Santa Cruz. There is a severe housing shortage in Santa Cruz. Santa Cruz rental property owners can get more for their dollar than they can in Silcon Valley. It is not rocket science. If you are planning on buying an investment property think of Santa Cruz. I am a realtor and a Santa Cruz rental property investor since 2000. There are many reasons to invest in Santa Cruz rental properties, some of which I have discussed in this article. Today I want to talk about what the pros and cons are in renting to UCSC students. Here are the pros that I have experienced. 1. Vacancies are virtually non existent: There are almost $18,000 UCSC students and in any given year there is only room to house about 8,000 of them on campus. There are always many thousands of students looking for a place to rent, so the potential pool leaves no vacancies in your Santa Cruz investment rental properties. 3. The rent money is very secure: The students get financial aid and/or are supported by their parents. In 17 years and 4 rental properties as a Santa Cruz rental home investor I have only had a problem getting paid once. 4. UCSC makes the rental process very easy for a Santa Cruz rental investor: They give workshops to the students on what they need to do to look attractive to a Santa Cruz rental investor. They come to you with complete rental applications, credit reports, references, and certificates saying they understand what it takes to be a good renter. The university posts your rental for free so you have a large pool of possible renters. 5. Students replicate themselves making the rental process even easier: My experience has been when one student moves out they have another take their place making the process seamless for the Santa Cruz rental investor. 6. Santa Cruz students are often long term renter: If you get the students early, in their sophomore or junior year they often stay for 3-4 years or more. making the cost of turnover very low. 7. Santa Cruz students can vacate in the summer if you want a summer beach home that is rented for 9 or 10 months: If you are a Santa Cruz rental property investor who wants a place in the summer for yourself you can rent to students during the school year and keep it for yourself in the summers. Many students go home in the summers, and the ones who don't can always find a sublet from another student who is going home. It is a way to have a vacation home that more than pays for itself. 1. Insurance on the house can be tricky: Recently many insurance companies, including the one I have always used, State Farm have decided they do not want to insure homes that are filled to the brim with students in college towns. They see them as Frat houses and won't write new policies. You can get commercial insurance, which is more expensive than residential or find the rare insurer who will do it. I found that CIG insurance out of Monterrey was willing to write a residential policy at competitive prices. 2. Large homes can be a hot bed of petty emotional issues for the Santa Cruz rental property investor. : If you are the owner of a large home with 6-10 students they may turn to you when there is a spat between the tenants. It is a time and emotional drain. I put one person in charge and have that person deal with issues like who is going to clean the house, noise complaints, bullying, etc. They have the final say. It works pretty well. 3. Students are often unaware of what it takes to take care of a house: Students do not always understand what it takes to care of a home and things can be damaged by mistake, even without large parties or Frat behavior. The way to ameliorate this is to buy a house that does not have delicate finishes and educate the students on basic home maintenance. My tenants know they need to call me right away if something is wrong and not let a small problem get out of hand. I would rather be over called than under called, and they know it. So as a long time owner of Santa Cruz rental property I can enthusiastically say that renting to Santa Cruz students is a good thing from an investor perspective and not something to be afraid of. If you have any questions about becoming a Santa Cruz rental property investor please feel free to contact me.